Photographing Poverty: Realism or Sentimentality? Debates about the moral value of photography have to deal with poverty. One might think that there is little to discuss: poverty can be distressingly visible, and photographs have been a principle means for motivating efforts to help those in need. From the classic photographs by Jacob Riis and Lewis Hine to those persistent Save the Children ads, images of poverty and particularly of its effects on children have raised awareness, shaped public policy, and opened pocketbooks. All that remains, one might think, would be to continue to produce compelling images of destitution. This photograph from Haiti may not prick one’s conscience, perhaps because we can’t see the child’s face, but it remains a striking image. It also reflects the other side of the debate about photography’s moral legitimacy. One argument against the image is that the photographic depiction of poverty is in fact highly sentimentalized: a continuation of the stock attitudes–including charity, but also condescension–of the Victorian era. In short, the photograph of the poor child is a transposition of the Victorian waif from illustration into photography. For this and other reasons, photographers such as Gordon Parks and others have been accused, not entirely without cause, of simplifying or otherwise aesthetically framing poverty as an object for concerned contemplation, instead of either exploring the social fabric of the poor community or exposing the causes of its continued oppression. This photo would seem to fall under that criticism. The image is too good: on the one hand, a near-perfect outline of the waif and, on the other hand, a composition of elegant design and rich colors that belies the child’s lack of resources. Indeed, it could be in a Renaissance painting, and both the cropping and the oddity of the one shoe draw one into a close study of the image itself and thus away from critical attention to the social and economic conditions that lie behind it. The photograph may reflect another criticism as well. Somewhat paradoxically, photography is faulted (and by the same people) both for not evoking the correct moral response and for wearing out compassion or other charitable or progressive inclinations. (Save the Children does come to mind.) That idea could drive photographers to look for new angles on an old subject, and the image above certainly has been cropped in that manner. 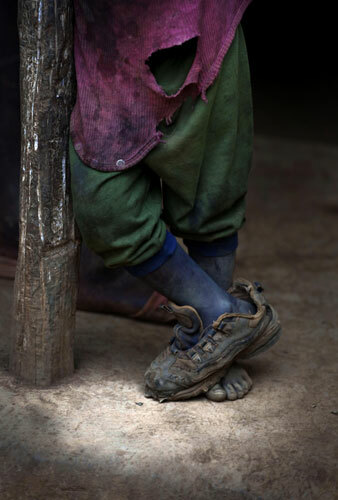 Instead of the typical dirty face, we see asymmetrical feet (one shod and one bare); instead of the usual sense of need, there is a strange self-sufficiency in this child’s pose; instead of the same assurance that everyone knows what is needed, wearing one shoe creates a whiff of illegibility. And so a photo that may be making poverty into art could also be reworking viewing habits to suggest that seeing is not knowing. The debates about photography are not going to be resolved today. I don’t think one can or should avoid the work done by public art, which includes channeling sentiments and thus risking sentimentality. Photojournalism does traffic in stock sentiments, just as intellectuals rely on stock criticisms. I’ll admit that there are days when I side with Oscar Wilde’s comment that “One must have a heart of stone to read the death of little Nell without laughing.” But there is still reason to take a good look at the other side of privilege, and to consider how compassion must at some point be a way of seeing. Last night, I was accosted by a street kid begging here in Rio who wouldn’t let me pass and then became too “handsy,” especially around my pockets and bag, presumably to see if anything was unbuttoned or unzipped. I shooed him away in Portuguese, while an old woman next to mean moaned about how awful the neighborhood has become. Ironically, about the only thing in said bag was an ethnography of B-zian favelas. Even after writing on Gordon Parks’ kids-in-favela photo essay and spending hours and hours pouring over Bzian street kid photos, my immediate reaction was the same as any common tourist. Shock of the real, indeed. I love photos on theme “poverty”; it is very beautiful! The compassion teaches the poor people to suffer. It is necessary to change the attitude. I speak: «The sufferings of poor people consist from comparison of the their standard of living with the imposed high standards ‘of worthy life’». These days, singular images (as the one above) on this subject (and photojournalism in general) are going to evoke criticism from one side or the other, if not both- and then some. And you name a good many of the reasons why- they’re too sentimental, too in your face, too repetitious, too artsy, not artsy enough… And it sure doesn’t help when a specific photojournalistic essay is criticized more for its current art aesthetic, than how effectively it conveys the necessary info of the subject at hand. There have been volumes written about photography and the aesthetisation of poverty. 10-15 years ago, it was about Sebastiao Salgado and his “too artistic pictures” of famished people… Unfortunately poverty is still around and there is donor fatigue. In a blase world we need to be shocked at regular intervals, to wake up from complacency and isolationism. Photographs are (should be) witnesses. When they are talented they produce unforgettable images so we will not forget how the other fifty per cent (more these days as they are the majority world) live (and die). I agree with Pierre that there has been volumes written on ‘picturing famine’, and more broadly ‘poverty’. Although some of this focusses on the ‘aesthetisation’, the majority looks at power-relations in regard to representation – who decides on the type of photos that are taken and published? There is much criticism of how conflict, poverty and disasters are presented in European and North American media – that the picture is predominantly negative. This is the key – and where I disagree with Pierre – in that we should not be periodically ‘shocked’ but graudally educated – including visually – about the causes of such negative occurances, as well as the more nuanced existence of those living in developing countries. It is only through a more in-depth approach that we can escape stereo-types that are demanded by editors in order to supposedly speak to their audience. We need to have a balanced picture of people to connect with them as humans connected to us, rather than distant strangers worthy of our compassion. We need to see what we have in common, not what makes us distant. But photography, and the media, cannot be held responsible for our world view, and education must also play a part in giving us a more balanced and detailed view of the world. I will not disagree about the benefits of gradual education versus “shocking”. Increased awareness about the realities of poverty, getting out of the otherness, looking for what is making each of us part of the same world is what every parent and teacher should feel responsible for showing to children. However I tend to believe that the media have a part of social responsibility in their representation of issues.